Preparing For Our Children's Future: ~What's Cooking Wednesdays~ Coconut Cake from Scratch! 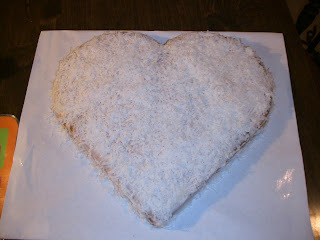 ~What's Cooking Wednesdays~ Coconut Cake from Scratch! This year for our Anniversary (our elopment Anniversary! ), I made a coconut cake and icing from scratch! Next time I will either double the icing recipe or make it with sour cream though. It was good, just thin. 1. Heat oven to 350°. Grease bottom and sides of rectangular pan, 13 X 9 X 2 inches, 2 round pans, 9 X 1 1/2 inches, or 3 round pans, 8 X 1 1/2 inches, with shortening; lightly flour. (Note: I used an 8 inch round and a 8x8 inch square. To make the heart, you cut the round in half and put the rounds above the square, forming a heart shape!). 2. Beat all ingredients except egg whites and White Mountain Frosting in large bowl with electric mixer on low speed 30 seconds, scraping bowl constantly. Beat on high speed 2 minutes, scraping bowl occasionally. 3. Beat in egg whites on high speed 2 minutes, scraping bowl occasionally. Pour into pan(s). 4. Bake rectangle 40 to 45 minutes, 9-inch rounds 30 to 35 minutes, 8-inch rounds 23 to 28 minutes, or until toothpick inserted in center comes out clean or until cake springs back when touched lightly in center. Cool rectangle in pan on wire rack. Cool rounds 10 minutes; remove from pans to wire rack. Cool completely, about 1 hour. 5. Frost rectangle or fill round layers and frost with White Mountain Frosting. For frosting, in a large heavy saucepan, combine the sugar, egg whites, water, salt and cream of tartar over low heat or double boiler over simmering water. With a portable mixer, beat on low speed for 1 minute. Continue beating on low over low heat until frosting reaches 160 degrees F, about 12 minutes. Pour into a large mixing bowl; add vanilla. Beat on high until frosting forms stiff peaks, about 7 minutes. Spread frosting over top and sides of cake. Sprinkle with coconut. Store in the refrigerator. For more great recipes each week, and to join "What's Cppking Wednesdays", visit Jess's blog, "It's All About The Savings"!